Adidas Response Trail Review - Buy or Not in Apr 2019? 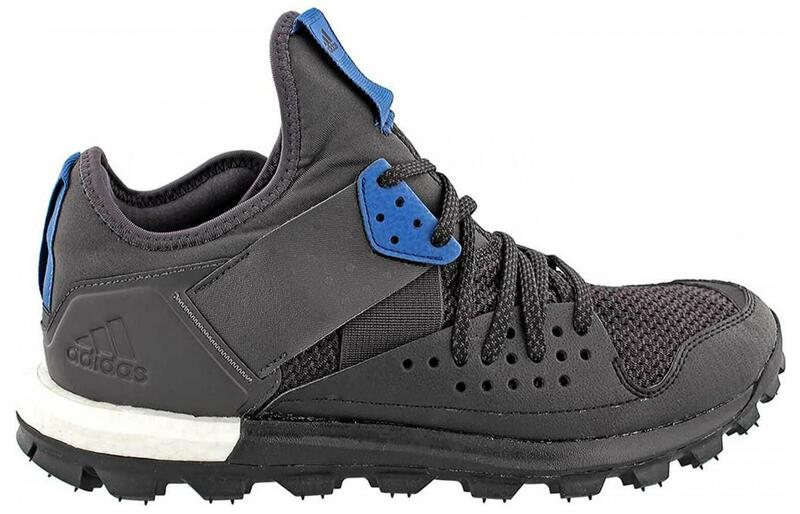 The Adidas Response Trail is a shoe that is designed to perform well on rugged terrain. Adidas has taken some of the best performing features and utilized them to develop a shoe that you will be impressed with. Teaming up with Continental Rubber, the Adidas Response Trail outsole is one that is second to none. The rubber is durable, protective and provides amazing traction. The outsole also utilizes lugs that make this shoe work well from house to trail, as Adidas describes it. The midsole uses Adidas Boost cushioning that is strategically placed to ensure maximum energy return and high performance. The upper is built to support the foot with a strong lacing system, Fitbands, and a seatbelt overlay. In addition, the shoe has an internal heel counter and a heel overlay to keep the heel locked in place while running on unstable terrain. We have spent 3.5 hours analyzing a total of 523 reviews. I got these for two reasons, casual and outdoors running, especially trails, and sometimes use them for mountain biking, the tire tread works great and its durable with good grip, breathing for my feet is good and these shoes do give me good comfort and protection. My feet are difficult, my heel is narrow and my toes are more than wide and these fit me really good, in fact, I can move my toes inside the toe box, the heel is comfy and I can feel the stability in the way it securely locks my heel, really good shoe, love it. Easily the best trail shoe for me and I have tried a few, lot's of super cushion, major energy return when I run, I have a wide foot so I got these a half size bigger and the fit is absolutely on target. The shoes surprise me, rugged and grippy for even the toughest local trails and the comfort is amazing, everything about this shoe is tough and durable but very comfortable. These shoes outshine other shoes because they are much more durable, got a fair bit of weight to them but still light enough for hill trails, love the grip and as for the cushion, easily the best shoe around in this price range. As far as investment goes, the price was ok for me and the shoe is a trail beast it works in all weathers and the ride is superb, a lot of the high performance is down to the sole which grips all surfaces, rough, gritty, dry or wet dirt, excellent shoe, well worth the price tag. As soon as a tried them on and put my foot down I knew these had extra everything, I don't worry about grip in these because they grip any surface, for my long runs, the comfort is their right through the run. Breathing for my feet is ok but could be better. Durability is key for me when running trails is the sole, the tread is unique and seriously good with the type of rubber that won't wear out easily. I live in a hilly district, we have uphill and downhill trails and I love these because it makes no difference to grip and stability in these shoes. Wet mud, dry dusty dirt, loose soil, whatever, I find these shoes just stay in control. A little heavy but no big deal prefer a bit more weight in return for stability and grip. After trying these, other shoes I had just seem average when it comes to trail running because these are the deal. Sure they look robust and chunky because they are robust and chunky. My first time to wear them on a locally known trail for lots of different surfaces and the shoes were fantastic. What I love about my shoes is toe box space, plenty of it, the special durable sole and that amazing bike style tread, the uppers give enough air for my feet but keep the dirt out and the fact that these are durable and can take any type of punishment. Lovely constant response level too. I guess these work for some runners, they were *not* right for me. I sent them back. Upper is ike a sock made from neoprene and gives little support, even when tightly laced. The shoe tongue is almost nothing, and no real padding for the top part of the foot. The sole is so heavy and the shoe just feels too clunky. As usual, Adidas do run more small for sizes. I had to go up by a 1/2 shoe size. I do have an average width size foot and the response shoe model is way to tight for my feet. I accept the shoe is good but I can't enjoy the benefits because of the fit. For me the upper has too much flex, too much give, despite the bulky looking overlays and the weight starts to pull after a few miles because the shoe is much heavier than I prefer. I like light shoes but its difficult to get durable and light in a shoe so I tried these but way too heavy. Of the 523 reviews we found in total, 12% were negative, and 88% were positive. The Adidas Response Trail outsole is made to stand up to the elements encountered while out on the trails. Adidas has partnered with Continental Rubber, a leading car and bike tire company, to ensure that the outsole is durable and strong. The outsole is comprised of carbon rubber. The Continental Rubber used on the outsole delivers optimal grip on a variety of surfaces from road to trail. The outsole is said to provide 30% more traction on dry surfaces and 32% more traction on wet surfaces. 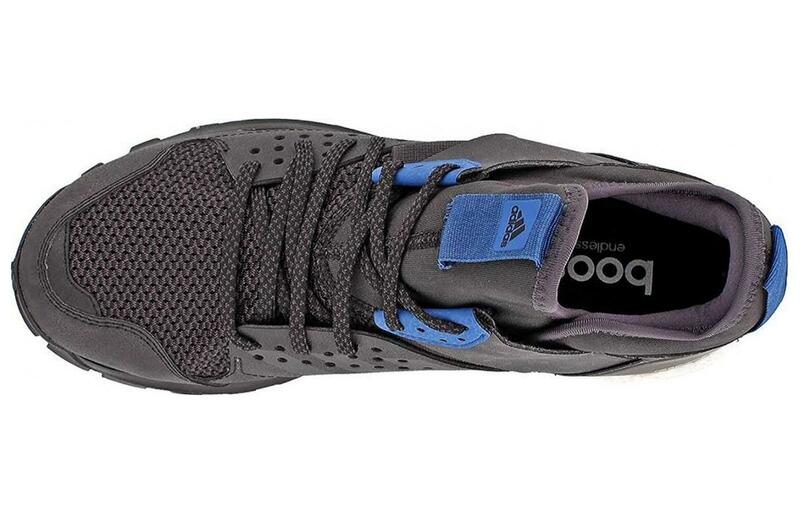 The outsole also has TraXion lugs that are multi-directional. These lugs provide grip that stands up on roads and trails, allowing for house-to-trail running that is precise and effective. The high-performing outsole is a feature that Adidas has taken the time to perfect, and reviewers agree that the shoe’s outsole stands up on a multitude of surfaces. Reviewers also felt the outsole was very durable. The midsole uses Adidas Boost technology to create a soft, cushioned feel while running on trails. The Boost cushioning is foam cushioning that is designed to consistently perform in varying conditions, while keeping its cushioning properties. The cushioning is comprised of blown TPU pellets that combine during impact and offer flexibility before toe-off. Unlike standard EVA, the soft cushioning provides a good amount of energy return that optimizes running performance. The Boost cushioning does not run the full length of the shoe, but Adidas has strategically placed it in places that optimize responsiveness. The Boost located on the heel provides shock absorption, while the Boost on the forefront provides energy during toe-off. To help maintain durability and additional cushioning, there is a layer of EVA that is in between the Boost cushioning. Reviewers were impressed with the level of comfort and responsiveness provided by the Adidas Response Trail’s midsole. The upper is designed to be a comfortable, yet protective feature for trail runners. It uses a one-piece design that is made from a stretch mesh. The mesh material is both breathable and water-resistant. The mesh also stands up to abrasion, keeping the foot protected on the trail and road surfaces. The synthetic overlays keep the foot locked in and provide added protection. The design also uses what’s described as a seatbelt webbing. The webbing provides a strong amount of durability, security, and support. The supportive upper has a heel counter that prevents the heel from slipping. There is also an Ortholite sockliner that is comfortable with its sock-like feel. Additionally, the sockliner wicks away moisture and dispels odors. The upper also has adjustable lacing that uses Fitbands to provide stability. They allow for quick and snug lacing as well. Reviewers felt that the upper offered an enhanced comfort compared with many competitive models on the market. The Adidas Response Trail weighs in at 12.3 ounces. This is somewhat heavy shoe, but given all of the trail features that are used to ensure grip, the weight is to be expected. Reviewers still felt that the shoe had a lightweight feel. This trail shoe provides a good amount of breathability. The one piece upper uses a mesh material that keeps the foot cool and dry. The material works to wick away moisture. The Ortholite sockliner also provides breathability with comfort. Reviewers felt that the shoe stayed comfortable in hot or cold conditions. The Adidas Response Trail is a trail shoe that is built with comfort as a key feature. The shoe uses Boost cushioning, a foam layer that is designed to provide a comfortable yet responsive running experience. The upper also uses a breathable mesh material that keeps the foot comfortable, dry and cool while running in cool and warm conditions. There is also an Ortholite sockliner provides a comfortable sock-like feel that keeps the foot cool and dry. Reviewers felt that shoe provided a superb amount of comfort. This is an interesting looking shoe. It looks to have an old-school feel with thick rubber in a variety of colors. The seatbelt overlays wrap the front and side of the shoe to add to the unique look of the shoe. It is definitely not a streamlined shoe, but for use on the trail, its heavy look should hold up well. The Adidas Response Trail is built to be a strong and durable shoe. The shoe’s outsole uses Continental Rubber to create a strong base for combating trail surfaces. The rubber stands up to the wear and tear, while also providing traction that holds up on roads and trails. The midsole’s Boost cushioning is comfortable, yet durable. Its TPU pellet construction holds up on tough trail surfaces. The upper is also designed to be durable using a one-piece construction with synthetic overlays. The shoe also has a rubber toe cap that provides added durability. Reviewers said that the shoe holds up on the trails and roads, no matter how many miles were logged. 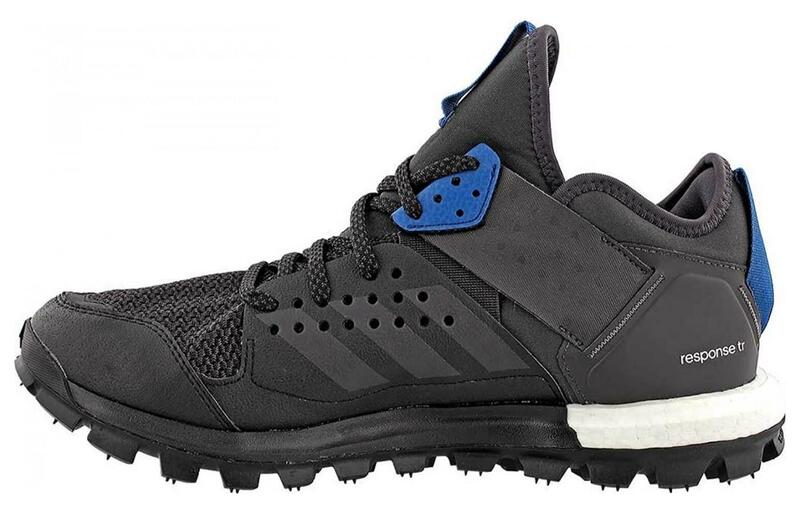 The Adidas Response Trail is designed to protect the foot while running on trails. The one-piece upper keeps the foot protected from debris. The shoe uses zoned protection with synthetic overlays placed to protect the foot and provide support. The thick rubber outsole uses Continental Rubber to protect the foot from rocks. The Boost cushioning is strategically placed on the shoe to provide protection and cushioning during impact. The sock-like design ensures debris stays out of the shoe. Reviewers were impressed with how well the shoe protected the foot. This shoe provides a good amount of responsiveness. The shoe uses Boost technology on the midsole to ensure optimal responsiveness. The Boost technology is strategically placed on the heel to provide shock absorption and the forefront to provide energy during toe-off. The shoe has an 8mm drop that contributes to the shoe’s overall responsiveness. The Adidas Response Trail is neutral shoe with some added features that provide support to runners out on the trail. The upper’s seatbelt overlay keeps the foot locked in place for a support. There is an internal heel counter and the overlay on the outside that provide added support and stability. The upper’s lacing structure ensures the foot stays in place as well. This Adidas shoe is designed as the name suggests to be used on the trails. However, Adidas has created a unique shoe that works well from road to trail. The shoe’s outsole is designed to provide protection while running on the trail, as well as a good amount of traction in the form of lugs. The Continental Rubber lends itself well to trail running as it is grippy and durable. The shoe performs well on technical trails. The Boost technology that is strategically placed ensures that the shoe performs well on wet or dry trail conditions. The upper with its thick rubber and seatbelt overlay keeps the foot protected from debris often encountered on trails. Reviewers thought that there was a good amount of cushioning and protection on the shoe to tackle the trails. Some reviewers felt that the performance on heavier trails was not great and felt that the shoe should stay on smoother trails. This is due to the more flexibility in the sole and the limited protection of push-through. The shoe is priced in the typical range for a trail shoe. Given the Adidas brand name and the number of features that keep this a high-performing trail shoe, purchasers should definitely consider this a good investment for the price. The Adidas Response Trail is designed to provide an optimal amount of traction when running on the trails or roads. Adidas has teamed up with Continental Rubber, a car and bike tire company, to ensure that the Response Trail has the grip and durability needed to stand up to all conditions. In wet or dry conditions, the shoe performs well with no issue. The shoe also uses Adaptive Traxion and lugs to improve grip when running on uneven terrain. The configuration of the lugs on the outsole ensures that there is grip on both trail and road surfaces. Reviewers were impressed with the shoe’s traction. This shoe offers a good amount of flexibility. The shoe’s Fitbands ensure that the foot stays in place while still letting the foot move naturally. Reviewers thought that the flexibility was enough. In fact, some thought there was a bit too much flexibility for the trail shoe. 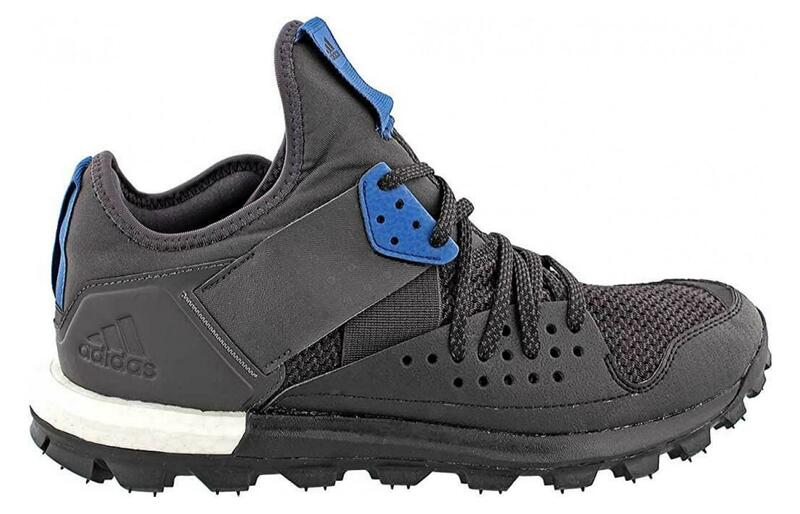 The Adidas Response Trail is a neutral shoe. With that in mind, there are not a lot of additional features on the stability side of the shoe. However there are a few existing features that ensure that the foot is stable. The upper’s seatbelt overlay keeps the foot locked in place. In addition, the upper’s lacing system and Fitbands provide stability and security. The shoe’s internal heel counter coupled with the overlay on the heel keep the heel stable. The midsole’s Boost cushioning also provides an element of stability with the strategically placed cushioning on the heel and forefront. This shoe has a drop of 8 mm. This is an average drop for many trail shoes, as it allows the cushioning to be disbursed throughout the shoe. The Boost cushioning is placed on the heel and forefront for better energy return and toe-off. The Adidas Response Trail is a highly effective trail shoe that will up your performance while protecting your foot. This shoe is the real deal when it comes to protective features that still allow for great performance. Adidas has teamed up with Continental Rubber to takes its rubber outsole to the next level in terms of traction and durability. The outsole is designed to last, while also ensuring that the show has excellent grip. Supporting the traction are the lugs that are strategically placed to ensure that the traction works well on and off the trails. The midsole uses Boost cushioning to maximize energy for better performance and protection. The upper is definitely made for protection and support, as the lacing system, seatbelt overlay and Fitbands all contribute to the shoe’s overall goals. The style of the shoe is a bit unique with the overlays, and some may not appreciate the look However, if performance and price are deciding factors, this is a shoe that should be considered, despite the different style. Reviewers were overall impressed with the Adidas Response Trail from a comfort, traction, protection and performance standpoint.